A healthy and attractive smile line includes gums that naturally frame the teeth with symmetrical contours along the entire ridge. However, gum recession and bone loss may occur for a variety of reasons. This can create indentations and uneven contours. These dark spaces between the teeth may become the focal point of your smile. To restore the defect, our New York City / Long Island periodontists may perform tissue augmentation, utilizing your own oral tissue or specialized donor tissue. 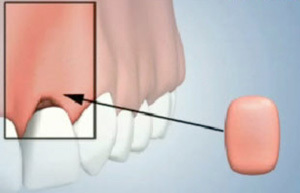 The first step involves preparing the area underneath the gums to accept the replacement tissue. With special care and attention, adequate tissue is placed in the deficient area to augment or plump up the ridge. 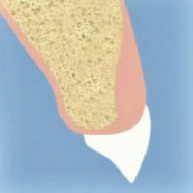 The graft restores the defect and helps protect the area from further bone loss. The end result is a more natural gum contour that compliments the tooth and contributes to an attractive and healthy smile. Post tissue augmentation, full, healthy gums are restored! If you would like to achieve an attractive, healthy smile, schedule a personal appointment with one of our talented oral surgeons by giving us a call or request a consultation online. During your consultation, they will perform a thorough dental evaluation and let you know whether you might benefit from gum surgery or the placement of dental implants in New York.